There are some things manufacturers do not want to tell you about matching pairs of microphones. Among these things, they will not tell you that Studio Projects is perhaps the only company who matches pairs for free. There are many variables in the manufacturing process of microphone capsules. Capsules generally have a loose sensitivity spec of +/- 2db as a result of these variables, so the difference between the minimum and maximum spec can be 4dB. This happens due to slight differences in the back plate, the tension of the Mylar film, the capacitor of the capsule, or even the internal Mic pre-amplifier. so the question is...what to do with it? When you test a capsule's sensitivity using a B&K measuring device, they are accurate between about +/-0.5dB. This is very good for measuring, and even when companies used to match pairs, they can't get that close. That is why most companies no longer match pairs. 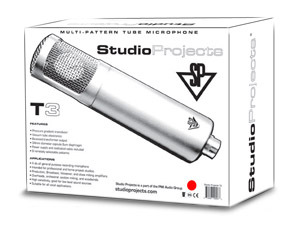 Studio Projects can build and make mics with a +/-0.5 dB sensitivity difference, but the price would be double, and the idea is make a good "affordable" mic that is up to the task of competing with the expensive mics. So fine, no problem, but the problem is one mic can be 4dB difference than another one. One way Studio Projects found to resolve the problem was to split tested capsules into sensitivity classes, and code them with a colored dot sticker. So to match them up, just pick two of the same color dots. Now does this effect the sound of the microphone. No, not really. All it does is effect handling spec, so there could be a little more noise, but this is non audible. It does not change the way the microphone sounds, so one mic to the next will not be different sounding, but could be a different sensitivity. No other manufacturer is taking these steps to make sure the end user can match up the mics they buy. It is a Studio Projects first! A mic, the color dot is on your original box, and also in the owners manual so you can find exactly what sensitivity your current mic is, and then match that with the new mic you are buying.